Stoneware, impressed, 2.25L, pewter lid. 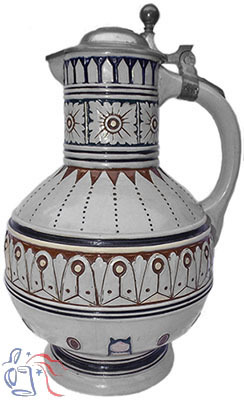 This is one of 10 designs, all serving vessels, provided to Merkelbach by “Regiersungsbauführer Meyer” (sometime listed as “Maier”) circa 1904. These pieces are designated “M1” through “M11” (M2 not listed) in the 1905 manufacturer’s catalog and marked on the bases in the same manner. Although the actual identity of this designer is today uncertain, Dr. Graham Dry, in his 1981 book entitled R. Merkelbach: Grenzhausen und München tentatively identifies him as Richard Meyer (1863-1953), architect and director of the State School of Applied Arts in Hamburg from 1905 to 1929.